Mezze is more than just food, it's a way of life. Learn secrets to the art of grazing with these delicious vegetarian stuffed vine leaves. 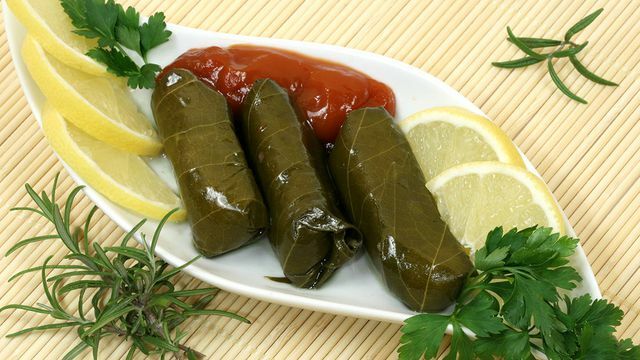 Dip the vine leaves in boiling water for 1 minute, remove and put aside. If using the ones from the packet remove and wash a few times to get rid of the salt. Combine the rice with the herbs, onions, tomatoes, lemon juice, oil, salt and pepper. Open the vine leaves on a board one at a time. Put 1 tsp of the mixture on each, fold in 2 sides then roll like a small cigar. Repeat till you finish all the leaves or the stuffing. Arrange the sliced potatoes in the bottom of a saucepan, then put all the stuffed vine leaves on top, cover with water. Use a plate to fit inside the saucepan as a lid, to stop the vine leaves from opening. Cook on slow heat for 1 hour or till the leaves are well cooked. Serve cold.